Home > Fire Safety & EMS > Fire Safety Evacuation Supplies & Tools > Fire Extinguisher Arrow Signs > Vinyl Self-Adhesive Fire Extinguisher Arrow Sign - 4" x 12"
Home > Fire Safety & EMS > Fire Extinguisher Arrow Signs > Vinyl Self-Adhesive Fire Extinguisher Arrow Sign - 4" x 12"
Home > Fire Extinguisher Arrow Signs > Vinyl Self-Adhesive Fire Extinguisher Arrow Sign - 4" x 12"
These durable and fade resistant Fire Extinguisher Arrow Signs are silk screen printed with UV inks on adhesive vinyl. 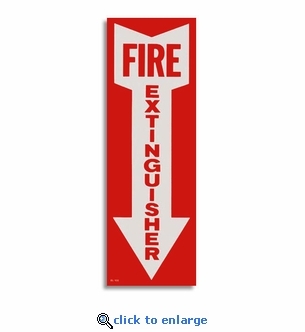 These laminated signs will ensure your fire extinguishers are easy to locate when immediate action is needed to prevent property loss or personal injury. Adhesive Vinyl Glow in the Dark Arrow Sign - 4" x 12"
For orders of 30 or more select UPS Ground for the best shipping rate.